Chronic inflammation is now acknowledged in the scientific and medical press as a key underlying cause, not just of ageing, but of almost all the so-called age-related diseases - heart disease, stroke, type 2 diabetes, dementia, arthritis, sexual dysfunction, hypertension and some cancers. No wonder that a paper published by the US National Institutes of Health in 2010 called chronic inflammation "a unified theory of diseases". Chronic inflammation is therefore largely unrecognised as such a serious threat by the general public. Until - too late - it manifests itself as a potentially fatal and always debilitating degenerative disease. Yet many experts now believe it's a bigger risk marker than cholesterol, and that reducing inflammation can deliver more health benefits than statins. 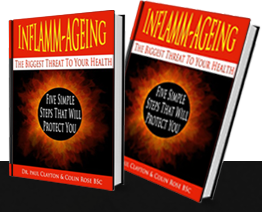 So if you are concerned to protect your health, this short free book by Dr Paul Clayton, former chair of the Forum on Food and Health at the Royal Society of Medicine, gives you essential anti-inflammatory advice. "Inflammation is an underlying contributor to virtually every chronic disease." Fortunately, this kind of inflammation can be tackled relatively simply and without resorting to drugs like statins with their unwanted side effects. It's all explained in the Inflamm-ageing book. DOWNLOAD this easily readable and actionable book NOW. The answer to the 10-a-day fruit and vegetable dilemma. Eat smarter! You want to stay healthy and live longer - but the new call for 10 portions of fruits and vegetables a day seems unachievable for most of us. Dr Paul Clayton, former Chair of the Forum on Food and Health at the Royal Society of Medicine has the answer. He has just responded to the widely reported University College London study published March 31st in The Journal of Epidemiology and Community Health. The study suggests that to cut the risk of cancer, heart disease and premature death, you need at least seven portions of fruits and vegetables a day - and ideally ten. The American Cancer Society was already advising nine portions of fruit and vegetables a day to help ward off disease. Says Dr Clayton: "I have been urging more fruits and veggies for years. But we have to be realistic. Most people today struggle to get to even 5-a-day, so my advice is to eat smarter. Focus on the foods and nutrients with the highest health payload. It's not just the number of portions that is important - it's what's in those portions. And it's not just fruits and vegetables - leading health researchers also recommend up to 4 servings of oily fish a week! "Just what is it in these foods that makes them so health protective? 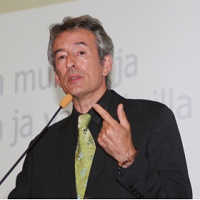 I answer that question in my e-book "Inflamm-ageing". Fruits, vegetables and oily fish contain valuable anti-inflammatory compounds. These combat 'chronic sub-clinical inflammation', a process which drives nearly all degenerative disease. We need to eat more of the key anti-inflammatory nutrients, and eat less of the pro-inflammatory factors found in so many processed foods. 'Chronic' means continuous and 'sub-clinical' means below the normal level of detection. Health scientists class this type of inflammation as a 'silent danger'. It causes progressive but largely undetectable tissue damage - until that damage finally manifests itself as an age-related disease. Inflammation is now widely recognised as a - probably the - key driver of declining health as you get older, triggering problems such as heart disease, stroke, arthritis, Type 2 diabetes, dementia and cancer. All of these diseases are affected by lifestyle and especially dietary factors. Fruits and vegetables and Omega 3s from oily fish are anti-inflammatory, but many of the foods we eat today are pro-inflammatory. These include foods cooked at high temperatures, foods cooked in most plant oils, and foods containing excessive sugar, starch and salt. So decreasing pro-inflammatory foods and increasing the anti-inflammatory elements in our diet is the vital health strategy. 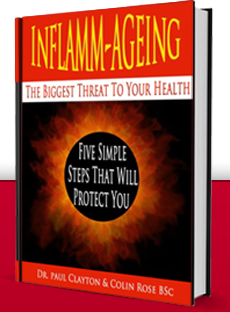 The background to this latest science and achievable and realistic tips for beating inflammation is all in Inflamm-ageing. Download it here now.